The 33’s legacy originates in the 70s, when Hunter – one of the US’ largest production yacht builders – introduced a 326 into its line-up. Last year that model was upgraded and evolved into the Hunter 33. For this year’s release, the boat has been refined further, and Bellatrix – the only 2005 Hunter 33 in the country – carries the pedigree with aplomb. them the "new" 41- and 44-foot models. As with them, he’s brought the beam well aft for more interior space, creating a 33 with flatter bilges, sleeker lines and a much finer bow. Driving this streamlined hull is a backstay-free, fractional rig (Selden spars) carrying a large-roach mainsail. With a displacement of just under 5000kg and a sail area of around 58m2, it’s a powerful combination and it works well. 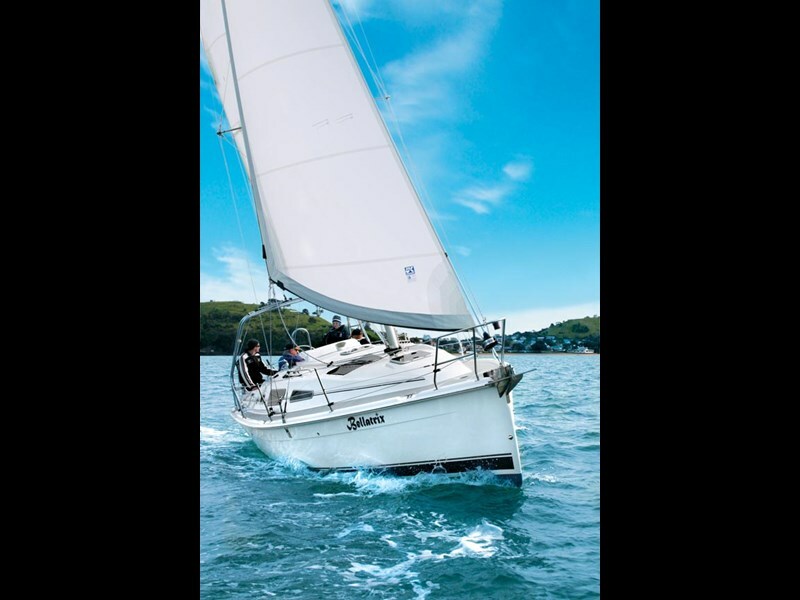 She’s responsive, accelerates easily and with her balanced, spade rudder, spins around the 1.67m fin keel quickly. A pleasure to sail. She’s also set up for easy sail trimming, with all lines leading through clutch blocks to the for’d end of the cockpit. A pair of self-tailing Lewmar #16s flanking the companionway hatch take care of winching duties, with two slightly bigger cousins set into the aft end of the cockpit combing for primary cranking power. They’re within easy reach if you’re sailing solo. The integrated helm console hides the Lewmar direct drive steering system. As suggested, it’s light and very responsive. My favourite feature, however, is the stainless steel arch over the cockpit, serving as the mounting for the mainsheet traveller. The mainsheet runs forward, along the boom, and back to the cockpit. This not only keeps the helm area free of the usual running rigging clutter, but also creates a much larger, cleaner cockpit than you’d typically find on a 33-foot cruiser. Her accommodation is set up for six, and you’ll seat all of them here – around the drop-leaf table – with room to spare. Behind the helm station – with ample room for instruments – a helmsman’s seat folds away to create a walkthrough transom. Together with the integrated swim platform and fold-up boarding ladder, this makes for easy entering and exiting the water. A hot/cold water shower is built into the sidewall of the walk-through.The stainless-steel arch, incidentally, makes for a solid handhold and, given the absence of a backstay, would be ideal (for cruising-oriented owners) for fitting wind generators, solar panels and radio antennae. A very generous locker is under the cockpit’s port bench seat (more than big enough to hold mooring lines, fenders and even an outboard engine for the dinghy). Opposite, the starboard bench lifts to reveal an opening hatch. It’s part of the aft stateroom, and in addition to providing light and ventilation to this cabin while at anchor (with the cockpit seat hinged open), allows the romantically-inclined to star-gaze from the double berth below. Bellatrix doesn’t have a spray dodger – I guess you could fit one, though the "naked" version is refreshing and offers excellent visibility over the wide coachroof and foredeck areas. Getting to them is aided by a sprinkling of coachroof-mounted grab rails and moulded, non-skid walking surfaces. It’s a clean deck, free of intrusions, so launching and dropping the kite should be problem-free. Ground tackle remains clear of the deck thanks to a roomy anchor locker. Hunter doesn’t believe in skimping on deck fittings: in addition to the Selden rig, the company has standardised on Lewmar, Harken and Spinlock deck gear for all models. And to make sure you don’t damage your new Hunter when coming alongside, the designers have added a new, heavy-duty rubrail to the boat. It’s a high-density vinyl with a stainless steel insert to enhance its looks. 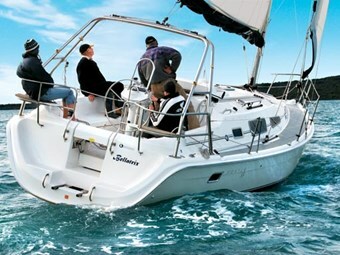 Standard Hunter 33s are equipped with an 18hp Yanmar diesel: Bellatrix’s owner elected to have a 29hp unit fitted. It will be useful when bashing into head seas becomes tiresome and you need to get home to meet your dinner guests on time. The engine feeds off a 95-litre fuel tank. It’s roomy, elegant and rich, with padded gray/blue upholstery contrasting nicely with the teak bulkheads/joinery (teak is standard), and white, vinyl ceilings and surfaces. Joinery is very neat, with plenty of curved radiuses and matched grains in the panels. Six will fit comfortably on the elongated, U-shaped settee surrounding the pedestal saloon table (it’s offset to port). Opposite, on the starboard side of the saloon, is another, full-length settee, so if you are in a party mood, you should fit 10 without too much trouble. The aft end of the settee also doubles as a seat for the nav station and electrical switchboard. With two skylights and a large opening hatch in the roof, and portlights along the side of the coachroof, the saloon enjoys plenty of light. Chef’s duties take place in a snug, U-shaped galley equipped with a two-burner LPG gimbaled cooker (with oven below), microwave oven, front-loading fridge and top-loading freezer. The chillers are both electric, and the shore power equipment is standard. Set into the Corian countertop is a stainless steel sink with mixer, and a large, top-loading locker. It’s designed to hold a garbage bin, but on Bellatrix it’s used a generous pantry – and I’d agree this is a much better use for it. Sleeping accommodation is divided between the forepeak master cabin (double berth), a double berth cabin aft, and two in the saloon, where the dining table drops to create a double bed. Like the aft stateroom, the forepeak has a dedicated hatch for ventilation and light. There is no shortage of wardrobe and storage space in the fore and aft cabins: but the couple relegated to the saloon berth might have to plead to share some of it. The Hunter 33 boasts a headroom of 1.93m, so all but the loftiest should move around in comfort. The single bathroom is set to starboard, behind the nav station. It’s equipped with a Corian countertop with basin and mixer, a shower and the head – all mounted into a one-piece, fibreglass shell. Fresh water’s stored in a 189-litre tank, and a 95-litre holding tank is standard. 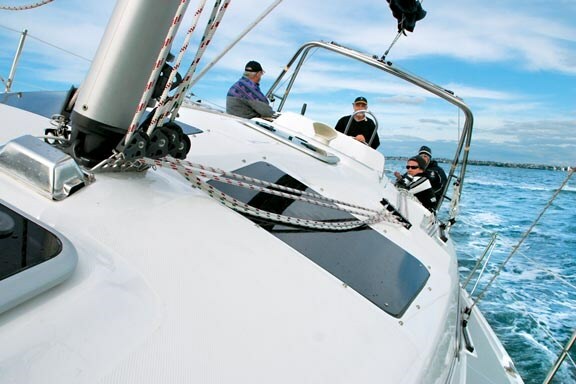 We hopped aboard Bellatrix on a pleasant Hauraki Gulf afternoon. The weather gods provided a variable 10-12 knots – a bit more would have been great. Still, what wind we had was enough to illustrate the Hunter’s sailing credentials. With sails cranked in hard, she clawed upwind with ease. Despite the size of the main, there’s no suggestion of tenderness: the 1.5 tonne keel and bulb keeps her firmly under control. Falling off, on to a beam reach, she remained easily balanced – no weather helm, and no tendency to round up. In the light airs, we managed around five to six knots: the owners have exceeded nine. With the large main and small jib, running off the wind will always be a problem – even when goose-winging. Commonsense suggests you’d gybe your way downwind, or better still, furl the jib and hoist the kite. The Hunter range is imported by Gulf Group Marine Brokers. Spokesman John Wanhill says there are around a dozen Hunters in New Zealand, mainly 306s and 285s, but also a new 38-footer. Most have been sailed to these shores. 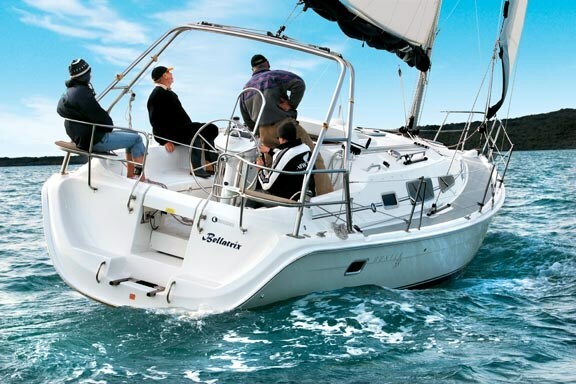 Other than her engine, Bellatrix is a standard, production Hunter 33. She’s well-equipped, well-made, and with her performance pedigree, should be a popular option for those looking to upgrade. Hopefully, we’ll see a lot more of them in our waters.